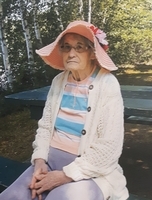 Provide comfort for the family of Agnes Tanner with a meaningful gesture of sympathy. 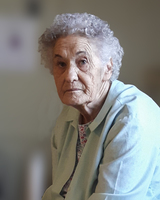 It is with great sadness that we announce the passing of Agnes Diana Tanner, 83, of Lunenburg and formerly of Stonehurst, on Thursday, December 13, 2018 at South Shore Regional Hospital, Bridgewater. Born in Stonehurst, Agnes was the daughter of the late King and Maisie (Knickle) Tanner. Agnes was a proud wife of a fisherman and homemaker. She loved to spend her time taking care of her family and spending time tending to her gardens. When she was able, she also enjoyed selling her knitted doll clothes and flower arrangements at flea markets in the area. Agnes was a great lover of dogs, and most recently Lily and Crystal were the benefactors of her love. Agnes is survived by her daughter, Jaunita (Leonard) Rodenhiser, Dayspring; sisters, Joyce (Ray Wile) Tanner, Wileville; Bonnie Ann (Avery) Milton, Middlewood; Wendy (Joel) Tanner, Stonehurst; brother, Lewis (Shirley) Tanner, Dayspring; grandchildren Andrew, Evan and Hailey. She was predeceased by her husband William; brother Barry Tanner and sister Bertha McNeil. Funeral arrangements are under the direction of the Dana L. Sweeny Funeral Home, 11213, Hwy. # 3, Lunenburg, and from where visitation will be held on Sunday from 7-9 pm with a funeral service to follow on Monday at 1:00 pm. Rev. Lee Simpson officiating. Interment will be in Lower Blue Rocks Cemetery, Blue Rocks. In lieu of flowers, memorial donations made to the I.W.K. or the Heart and Stroke Foundation would be appreciated by the family. To plant a memorial tree in honor of Agnes Diana Tanner , please visit our Heartfelt Sympathies Store. Even though i never saw my 1st cousin Agnes since i was a teenager living in West La Have, I do remember her visits with her mom, I do remember her gentle nature and loving ways, she looked so much like her mom, RIP Agnes. so sad to hear of Aggies passing. She was such a gentle kind soul with a dry sense of humor that could catch me off guard ( in a good way) . I always marveled at the relationship she had with her brother Lewis ( My step dad) - They shared the same dry sense of humor and at times would just share a smile across the room. It was like they knew what each other was thinking. Sharing a private joke. I will miss Aggie but taje cinfirt in knowing she is at last with Billy “her one and only love” .